Good morning fellow jalops and jaloppettes, while browsing craigslist this afternoon I and myself stumbled upon a gem of a Porsche 944 for project works and racing cars for you all. 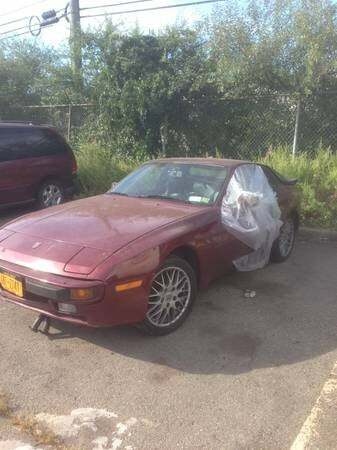 It is a 1986 Porsche 944 NA with an exploded motor for $2150; what a deal. I blew the motor a week or two ago and immediately bought another motor to be dropped into it but haven't had the time or effort to do so. The old motor has been pulled and I still have it. The head may be salvageable but everything most of the other parts are probably toast on the motor. The new motor turns but has not been tested by me. The guy I bought it from said it runs but the clutch on it is bad, so the clutch attached to the blown motor would have to be swapped onto that one, along with the wiring harness. The only bad parts: Rear wiper motor needs to be replaced, minor circular crack in windshield, only one speaker makes sound, hood cable loose, needs new catback exhaust, speedometer, tachometer, odometer in/op, minor accident damage (rocker panel/fender). With all the knowledge and skill on oppositelock I am sure a handy jalop will be able to appreciate this car as the true track machine it is. What say you jalops, nice price, or NICE PRICE?